Build your bot. Plan your attack. Compete to win. Botball starts with a workshop where teams learn to design, build and program their robots from scratch. Then teams have eight weeks to create a robot, plan a strategy and program to win. The final showdown is a fast-paced competition where teams maneuver their robots on a game board through obstacles and challenges. Note: Only secondary schools in Doha, Qatar are eligible to apply. Please note that lower and middle schools are not eligible to apply. Applications should be submitted by a school counselor or teacher. Unfortunately, applications from schools outside of the state of Qatar will not be accepted. Botball is a partnership between CMU-Q and the KIPR Botball organization. Students from the CMU-Q Computer Science Program are available to assist and answer questions. 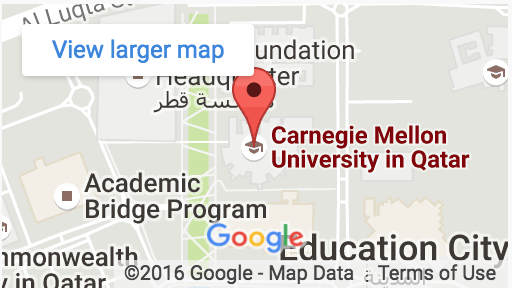 CMU-Q’s Computer Science program is based on the curriculum of the School of Computer Science at Carnegie Mellon in Pittsburgh, USA, one of the best programs in the world. Our award-winning faculty, researchers and students are internationally known for developing new methods and technologies that shape the world.